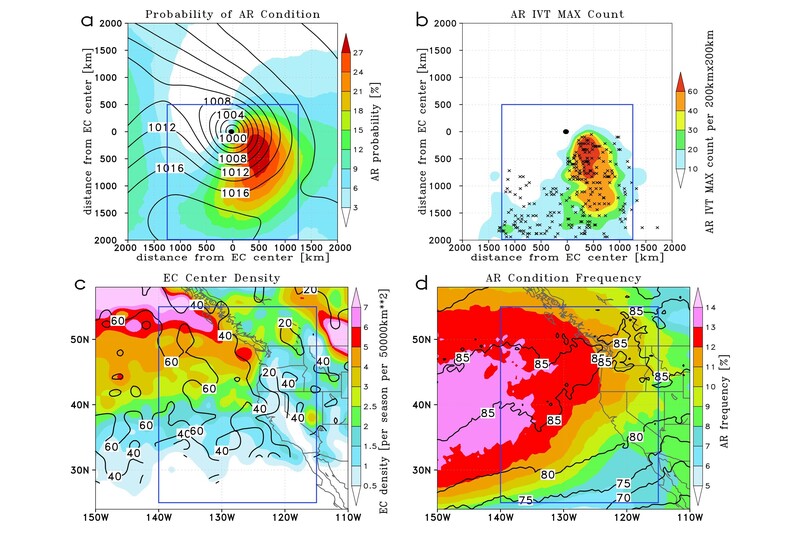 CW3E postdoc Zhenhai Zhang, along with CW3E director Marty Ralph, and postdoc Minghua Zheng recently published a paper in Geophysical Research Letters, titled: The Relationship between Extratropical Cyclone Strength and Atmospheric River Intensity and Position. In their study, the extratropical cyclones (ECs) and atmospheric rivers (ARs) in 1979-2009 cool seasons (November-March) over the U.S. West Coast were identified using sea level pressure and integrated water vapor transport from NCEP Climate Forecast System Reanalysis. An EC/AR relative composite approach was employed to determine the association between EC and AR. The statistical relationship and the dynamical interaction between ECs and ARs over the U.S. West Coast were investigated. The results of this study show that while 82% of ARs are associated with an EC, only 45% of ECs have a paired AR. The distance between the AR and an associated EC varies greatly. Roughly 20% of ARs occur without a nearby EC. Those ARs are usually close to a subtropical/tropical moisture source and include a southeastern anticyclone. AR intensity is only moderately proportional to EC strength. Neither the location nor intensity of an AR can be simply determined by an EC. An EC often intensifies the AR with stronger wind-driven meridional water vapor transport, while the southeastern anticyclone is also critical to the existence and intensity of AR. On the other hand, an AR can provide sufficient water vapor to enhance the precipitation and thus latent heat release, which contributes to EC intensification. Figure 1: (a): the probability (colors, %) of AR occurrence around the composite EC center (black dot). (b): the count of AR IVT maximum points (colors) in 31 (1979-2009) cool seasons in a unit area (40,000 km2) around the composite EC center; the “x” indicates the positions of the exceptional AR IVT maximum points. (c): the EC center density (colors, number of centers per cool season per 50,000 km2) and the percentage (contours, %) of ECs associated with AR. (d): the AR frequency (percent of time steps with AR in a cool season, colors, %) and the percentage (contours, %) of ARs associated with EC. The blue box in (a-b) is used to define the association between EC and AR. The blue box in (c-d) is the U.S. West Coast domain. Zhang, Z., Ralph, F. M., and Zheng, M., 2018: The relationship between extratropical cyclone strength and atmospheric river intensity and position. Geophysical Research Letters., 45, 164-176, https:// doi.org/10.1029/2018GL079071.